"So far this is the best I've come up with for waffles. They get a nice crispy outer shell in my waffle iron that I find delicious. Be warned: you have to like buckwheat to like these. Using half creamer and half milk is pretty awesome if you don't mind the extra fat/calories. You can substitute applesauce for the oil, if desired." Stir milk, buckwheat, almond flour, vegetable oil, eggs, baking powder, sugar, and salt together in a bowl until batter is smooth. Working in batches, ladle batter into preheated waffle iron and cook until waffles are golden and crisp, 3 to 5 minutes. 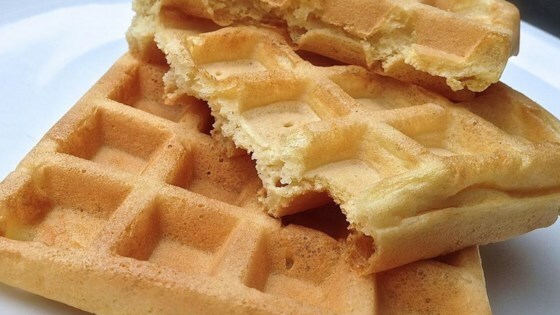 I made recipe as written and thought it was great-this is our new go to waffle recipe. TY for sharing!